Secondly on the day of the delivery you’ll with receive a text* and/or an e-mail with an hourly delivery slot. Thirdly if this is not convenient you can use the text or email to change the delivery date. This indispensable visual aid is produced to such high quality it will last you for many years. Whether used in briefing, recapping or discussing lesson topics the comprehensive illustrations and Key Points offer valuable support to any ADI. user guide PDF click here to download. Click here to see the subjects covered. 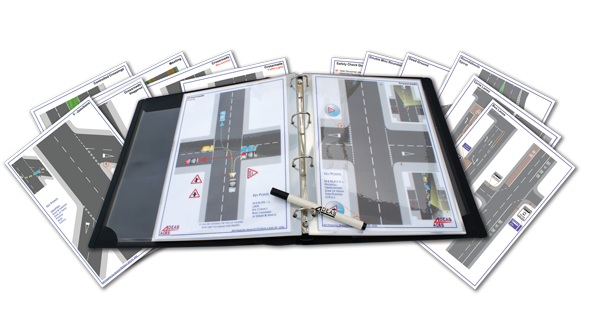 Again fully encapsulated and printed to the same high standards, contains a further 12 new illustrations to give ADIs the most complete visual training aid available. A number of the illustrations in this pack were created after taking onboard feedback from ‘YOU’, our customers. "The Honest Truth" Partnership is working to help reduce anti social driving and the number of 17-24 year olds killed or seriously injured on our roads by getting messages to young drivers through ADIs. "The Honest Truth" has a wide range of resources which are freely available to ADIs who sign up to the scheme. Click here.